Saturday, June 16, 2018, 2 – 4 p.m.
Join us for a hands-on graphic medicine comics workshop taught by two local artists. Graphic Medicine is a genre of comics that shares, investigates, and interrogates health and health-related issues. Learn more about this genre through a slideshow presentation and participatory comics workshop taught by local comics artists Kelly Froh and Max Clotfelter. This workshop is open to everyone ages 12 and up. All art supplies will be provided. Kelly Froh and Max Clotfelter have been making mini-comics and zines for over 20 years. 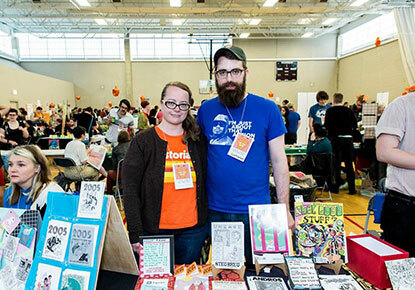 Kelly is the Executive Director of Short Run Comix & Arts Festival, now in its eighth year. Max Clotfelter is the founder of DUNE mini-comic drawing night, which has brought artists of all skill levels together once a month for almost six years. They enjoy teaching together and are excited to talk about Graphic Medicine and how although it may be a new term to many, the stories have been here all along. This workshop is presented in conjunction with Graphic Medicine: Ill-Conceived and Well Drawn!, a traveling exhibit from the National Library of Medicine on display in the Level 3 Living Room at the Central Library from May 21 through June 30, 2018.